Refused to execute script from ... because its MIME type (text/plain) is not executable, and strict MIME type checking is enabled. Is there a way to disable this behavior or is there a service that allows linking to GitHub raw files? 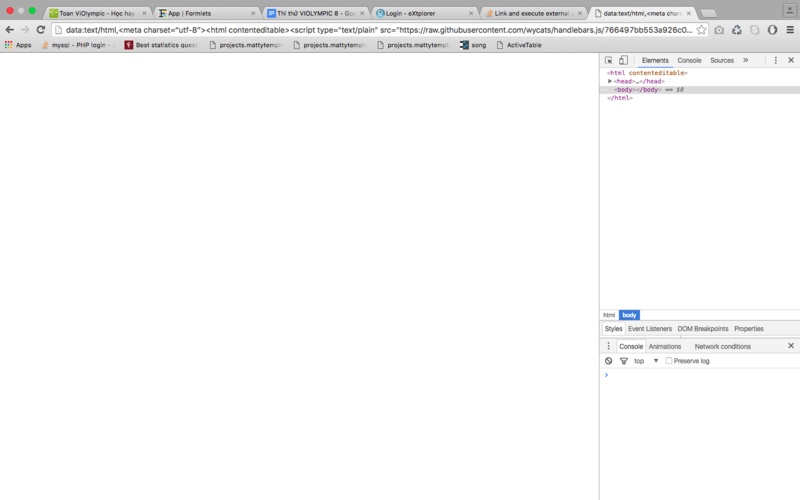 There is a good workaround for this, now, by using jsdelivr.net. Find your link on GitHub, and click to the "Raw" version. Insert /gh/ before your username. For production environments, consider targeting a specific tag or commit-hash rather than the branch. Using the latest link may result in long-term caching of the file, causing your link to not be updated as you push new versions. Linking to a file by commit-hash or tag makes the link unique to version. In 2013, GitHub started using X-Content-Type-Options: nosniff, which instructs more modern browsers to enforce strict MIME type checking. It then returns the raw files in a MIME type returned by the server, preventing the browser from using the file as-intended (if the browser honors the setting). For background on this topic, please refer to this discussion thread. Above answers clearly answer the question but I want to provide another alternative - A different view/approach to solve the similar problem. You can also use browser extension to remove X-Content-Type-Options response header for raw.githubusercontent.com files. There are couple of browser extensions to modify response headers. If you see Script evaluated successfully!, It means you are able to use raw github file in your code Otherwise Problem evaluating script indicates that there is some problem while executing script from raw github source. I also wrote an article on Requestly blog about this. Please refer it for more details. Disclaimer: I am author of Requestly So you can blame for anything you don't like. My use case was to load 'bookmarklets' direclty from my Bitbucket account which has same restrictions as Github. The work around I came up with was to AJAX for the script and run eval on the response string, below snippet is based on that approach. 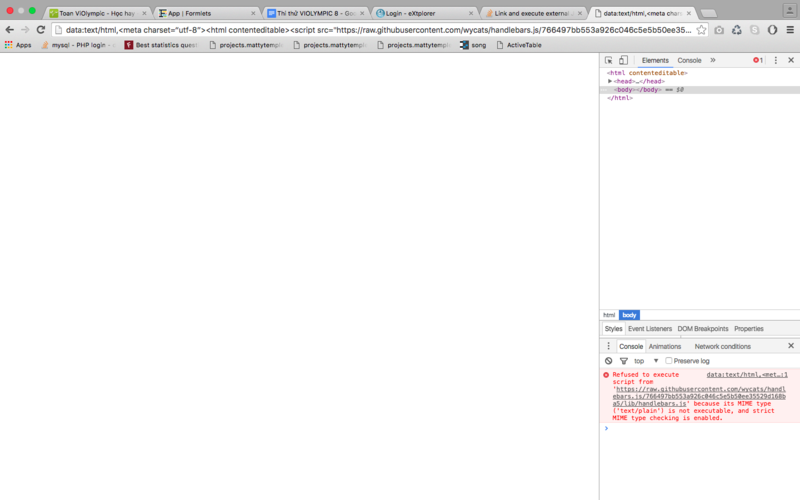 Note that appending of sourceURL comment is to allow for debuging of the script within browser's developer tools. GitHub Pages is GitHub’s official solution to this problem. GitHub Pages hosts your repo at a special URL, so all you have to do is check-in your files and push. Note that in most cases, GitHub Pages requires you to commit to a special branch, gh-pages. On your new site, which is usually https://‹user›.github.io/‹repo›, every file committed to the gh-pages branch (the most recent commit) is present at this url. So then you can link to your js file via <script src="https://‹user›.github.io/‹repo›/file.js"></script>, and this will be the correct MIME type. Do you have build files? Personally, my recommendation is to run this branch parallel to master. On the gh-pages branch, you can edit your .gitignore file to check in all the dist/build files you need for your site (e.g. if you have any minified/compiled files), while keeping them ignored on your master branch. This is useful because you typically don’t want to track changes in build files in your regular repo. Every time you want to update your hosted files, simply merge master into gh-pages, rebuild, commit, and then push. raw.github.com is not truely raw access to file asset, but a view rendered by Rails. So accessing raw.github.com is much heavier than needed. I don't know why raw.github.com is implemented as a Rails view. Instead of fix this route issue, GitHub added a X-Content-Type-Options: nosniff header. Use a third party CDN like rawgit.com.